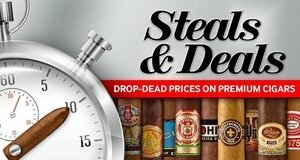 Steals & Deals Offers Huge Savings On Premium Cigars Daily! The all-new Steals & Deals is the ideal spot to save huge on premium cigars. Each day we’ll slash the prices on name brand smokes and feature them here at drop-dead prices. The reduced prices will be good until midnight or until they sell out. They may only last an hour or they may last all day, but once they’re gone, they’re gone for good! Be sure to check back each morning to see what we have up for grabs!